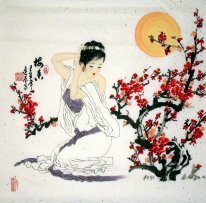 Chinese Beautiful Ladies Paintings for sale! 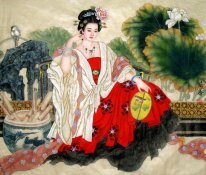 The history of painting of beautiful ladies in China can be traced back to the Jin Dynasty (265-420). 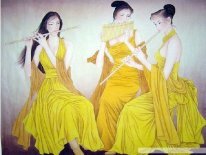 Originally, painting of beautiful Ladies refers to painting which take the life of literati & officialdom (at the middle and upper levels) and woman as its subject. Afterwards, it develops into one subclass of figure painting that specialise in depicting leisurely life of upper-class women.? In the course of development, its subject-matter was diversified. 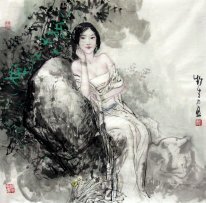 During Wei-Jin period, the main subject-matter for painting of beautiful Ladies is ancient virtuous women and fairies. 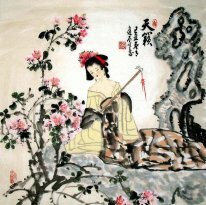 In Tang Dynasty, painters were keen on depicting Ladies in real life. In paintings, Ladies were enjoying the cool in the open air; or were making up; or wearing flowers in hair; or outing by riding horse, ect. Those reveal the leisurely life of upper-class women and their complicated inner world. 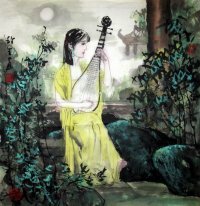 Among Five Dynasty, Song and Yuan Dynasties, ordinary female appeared in paintings. 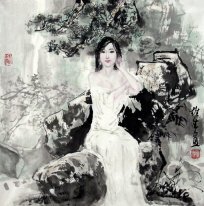 Painters depicted ordinary female just as them appear, intenting to not only praise their life stance of being happy to lead a simple and virtuous life, but also express sympathies for their poor life. In Ming and Qing Dynasties, all sorts of female of drama, novel and romaunt became the popular subjest-matter. Thus, the sphere of subjest-matter was expanded further, including all estates of women.? 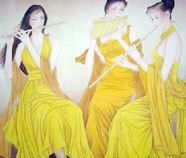 Although not all the women in painting are belle, people is used to call it painting of beautiful Ladies. Painters model various types of images of women according to their Muse. Times change, the definition of beauty changes as well. 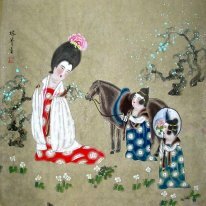 Therefore, the history of belle painting also records the vicissitudes of feminine charm. ?